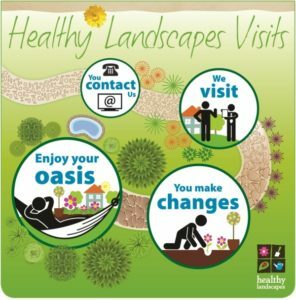 Sign up for your free 45-minute Healthy Landscapes visit! Are you looking for ways to have a beautiful landscape without spending hours of time, water and money? A Healthy Landscape visit can help you find ways to reduce the demands of your landscape, without sacrificing beauty. Be the envy of your neighbours! Healthy Landscape visit advisors can also share with you how to attract pollinators to your garden, how to build a rain garden, and the best way to start a new garden or mulching practices. Once the visit is complete, you’ll be provided with a free report that outlines recommendations on how to create a beautiful, low-maintenance lawn and garden. To sign up for your free, 45-minute Healthy Landscape visit of your property, complete and submit the form at the link below or call 519-822-1260, extension 2107. Visits are available May through August. What is the Landscape Visit Program? The Landscape Visit Program is a program designed to provide information on outdoor water efficiency, preventative landscape maintenance practices, and natural pest control alternatives to Guelph residents and area business. Through this program a City Landscape Advisor will visit your property to provide site specific suggestions and supporting materials regarding landscape design, maintenance, natural and drought tolerant planting alternatives, and natural pest control alternatives. Who is eligible to take part in the program? Any resident or business in the city of Guelph is welcome to take part in the program. The Landscape Visit Program is a complementary service with visits being free of charge to all participants. When will site visits begin? Site visits begin in May 2013 and will be booked between 12 p.m. and 6:30 p.m., Monday to Thursday weekly until August 25, 2013. Each consultation will be approximately 45 minutes in length. The last scheduled appointment of the each day will begin at 6:30 p.m. Please note that spaces are limited with approximately 500 visits available for the 2012 spring/summer season. Landscape Visit appointments will be booked on a first-come, first-serve basis. What is the goal of the Landscape Visit Program? The goal of the program is to provide area residents and businesses with first hand education and information about water efficient landscaping practices, natural pest control alternatives, and preventative maintenance practices that could be employed to limit outdoor water use requirements and proactively manage common outdoor turf based pests. What do I need to do in preparation? There is no preparation required for the visit. For the most part, the visit will be a simple assessment of the current conditions and future aspirations of your outdoor landscape. However, should you have a specific interest or purpose for your landscape visit, please mention this to City program staff when booking your visit to allow for preparation prior to your visit as required. Last Updated: June 9, 2017.